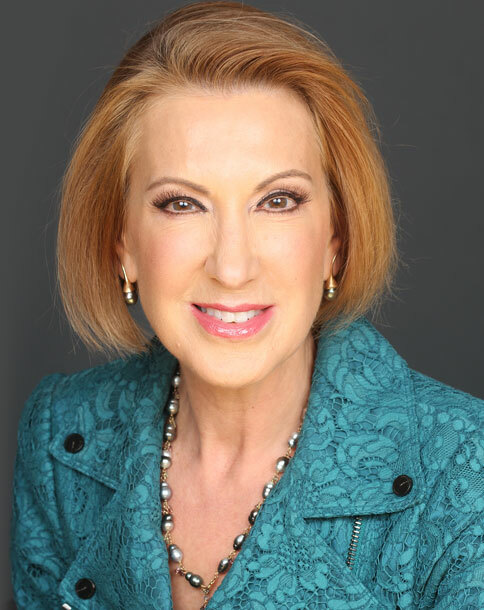 I first heard Carly Fiorina speak at the Global Leadership Summit on August 14, 2014. To say I was moved by her speech would be an understatement. I was amazed by this successful, talented woman and inspired by her philosophies. I spoke with Carly this week with the hopes of getting her perspective on leadership to share with you. I got a lot more. Let me give you some background on Carly. She started her business career as a secretary, and went on to become the chairman and chief executive of the largest technology company in the world, Hewlett-Packard. She was the first woman to lead a Fortune 50 business. She currently serves as the Chairman of the American Conservative Union Foundation, the Chairman of Good360, and the Chairman of Opportunity International. She started our conversation with a story. "When I was 8 years old," she said. "My mother gave me a plaque and it said 'what you are is God's gift to you, and what you make of yourself is your gift to God.' And that phrase has rung in my head my whole life." Carly's taken that simple phrase and used it to shape her leadership style. She focuses on unlocking the potential in everyone that she works with. Everyone that I have encountered in my life has huge potential, every organization has huge potential, and sadly too many people and too many organizations never fulfill their potential," she explained. "For me the great joy in life, the essence of leadership, is to figure out how to unlock potential in others and it's why I do the things I do and I hope that I'm making a difference in people's lives because it certainly enriches my life. Her concept of unlocking the potential in others was intriguing, so I followed up by asking her what it meant, and how we could all do it. It starts with a recognition that we get really confused about what leadership is. People think that leadership is about position or title or power, but leadership has nothing to do with those things. Leadership is actually about changing something for the better by tapping into your own and others potential and focusing that potential on a common goal and a worthy purpose. You have to realize that anyone can lead. She also pointed out that while we can work together on unlocking our potential and others' potential by collaborating, setting high goals, and supporting each other, there are always ways that our potential is being crushed every day. There are a lot of things that crush potential in us and in others. Bureaucracy crushes potential. Have you ever been to the DMV? Do you feel empowered when you leave the Department of Motor Vehicles? Absolutely not because of rules and processes. While some of it is necessary, too much crushes human creativity, ingenuity, and potential. So the goal is to get as much of that stuff out of the way. Her leadership style is very straightforward. She does what she does for others. She strives to make a positive impact on those around her, and sees that as the main focus of leadership. "I think the best leaders realize it's not about them, its about others, it's about impact, its about results." That impact is what motivates Carly every day and what pushes her to help those around her reach their full potential. It's not easy to achieve the level of success that Carly has. In fact, for women it may seem like even more of a daunting task. Carly recognizes that there are challenges that strong women face, one of them being the presumption of competence. When a man goes into a position, he is presumed to be competent. When a woman goes into a position, maybe not so much. So it means the burden of proof for a woman is higher. She has to prove that she is competent to be in the job. So how do we go about overcoming workplace challenges? How do we become leaders? What I would say first is know yourself. There are lost of ways to do that. You get to know yourself by working with others, by taking on tough challenges, by doing things you haven't done before, [and] by taking risks. It's important to know yourself and get to know yourself because that's how you're going to figure out what your gifts are. The second thing I would say is, all the things you think people are thinking about you, good or bad, don't let those things get into your head. They're not important. What's most important is for you to think about what you can contribute to this situation, how you can collaborate with somebody else to change the order of things, to have a positive impact. None of this is rocket science. She also stressed the importance of being in the moment, and focusing on the opportunities at hand. I have seen so many people shortcut their career because they're so worried about how far they're going to go and they forget about the opportunity right in front of them to make a difference. People who get ahead focus all their energies on doing the best job they can in whatever the circumstances they find themselves in, so wherever you are whatever you're doing, do the very best you can right there, make the biggest impact, think about how to change the order of things. See possibilities, not limitations. See possibilities in yourself. See possibilities in others. See possibilities in the circumstances around you. And you'll have an impact and make a difference, and when you do, people will take notice.